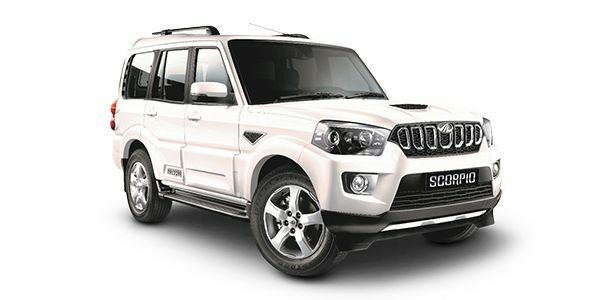 The updated Mahindra Scorpio aims at refining the overall package while retaining the butch appeal of the SUV. Expectedly, the exteriors continue to remain familiar, save for minor revisions to the grille, the tail lamps, bumpers and new 17-inch alloy wheels. Updates to the interior are fewer still, and comprise of new faux leather upholstery, a repositioned 12V socket and a rubberised pocket for the gear knob in the front of the gear lever. The biggest change, though, is under the bonnet. In the S7 and S11 variants, you get 140PS of power and 360Nm of torque ( 20PS and 40Nm extra) compared to the older version. The prices of Scorpio diesel variants start at Rs. 10.00 lakh and the top-end diesel is priced at Rs. 16.44 lakh. Mahindra Scorpio is available in 9 variants and 4 colours. The claimed ARAI mileage for the Mahindra Scorpio diesel is 16 kmpl. Q. Which car is better between Scorpio and Duster? Q. Can I get captain seat? This, the new Mahindra Scorpio isn't just a facelift, it is a thoroughly reworked SUV. And as our review reveals, it's a job well done! More power, more features, more attitude. But how much of a step up is the new Mahindra Scorpio? Mahindra has updated its old workhorse Scorpio and launched its facelifted edition in the price range of Rs 9.29-16.01 lakh (ex-showroom, Delhi). Available in S3, S5, S7, and S11 variants, the new Mahindra Scorpio can be had in three different engine options - a 2.5-liter putting out 75PS/200Nm mated to 5-speed manual transmission, a 2.2-liter delivering 119PS/280Nm through a 5-speed manual, and a 2.2-liter making 140PS/320Nm featuring a 6-speed manual gearbox. In term of exterior and interior changes, Mahindra has carried out nip and tuck job to improve looks of the new Scorpio. Upfront the grille has undergone change while the alternations on the side and at the rear are subtle at best. Inside the cabin, improved quality and premium features up the desirability quotient of new Scorpio. 2017 Mahindra Scorpio is up against the likes of Tata Safari Storme, Renault Duster, Hyundai Creta, and its own cousin Bolero among others. Going by the looks of the refreshed Scorpio, it seems like Mahindra hasn’t put enough effort into giving it a fresher fascia. Sure, there are a few cosmetic updates but one really needs to be a car geek to spot them. The seven-slot front grille seems like it has been taken off of a Jeep Compass! The redesigned front bumper houses bigger fog lamps with chrome surrounds and is accompanied by a redesigned skid plate too. On the side, the ORVMs get integrated turn indicators and the refreshed Scorpio also gets newly designed 17-inch alloy wheels. The design of the air extractors for third row windows have been tweaked as well. The plastic cladding around the rear number plate has been ditched and the tail lamps now get a red-lens treatment. All in all, we won’t blame you for mistaking the updated Scorpio for its predecessor. The Scorpio’s interior was never high on practicality or quality. With the facelift, Mahindra has tried to add a dash of both. The seven-seater’s all-fabric upholstery has been replaced by faux-leather for the seats, steering wheel and the gear lever. The darker dual-tone theme, however, seems a bit dull. On the practicality front, Mahindra has bolted a sunglasses holder on the roof and added bigger cubbyholes for your knick-knacks, including a holder for your smartphone. The feature-list has been updated with a reverse camera (featuring dynamic assist), one-touch lane change indicators and auto window roll-up. Basic safety features like ABS and dual airbags are still missing in the base variant, which is a bit of a letdown when you consider its price. This is where Mahindra has played its Joker. In essence, the updated SUV can be had with two diesel engines - the 2.5-litre m2DICR and the 2.2-litre mHAWK. The former unit is reserved only for the entry-level variant and produces 75PS/200Nm. Yes, that’s not impressive at all. However, the smaller engine is available in two states of tune - 120PS/280Nm and 140PS/320Nm. The higher tune comes with a new 6-speed manual transmission, while other units continue to be offered with a 5-speed manual transmission. The micro hybrid technology and the low-range 4x4 system continue to be the Scorpio’s standout features. It still doesn’t get an automatic transmission. However, Mahindra is expected to equip the Scorpio with the torque converter from the XUV500. Mahindra hasn’t officially revealed the mileage figures of the updated Scorpio. Are they worse than before? Well, only a comprehensive road test can answer that question. This time around, Mahindra has simplified the variant list. Only six remain now - S3, S5, S7, S7 (140PS), S11, S11 4x4. Don’t ask us what happened to the S9. Probably the fear of a smaller suffix after the ‘S’ would have created the wrong impression with those who knew that its predecessor had an S10 variant. The S3 is the only variant that comes with m2DICR engine and should be ignored. Less than a hundred horses to power a 2.5-tonne SUV is just cruel. Moreover, with its black bumpers, black cladding and exposed steel wheels, it screams out that you are a cheapskate. The 120PS/280Nm mHAWK powerplant is available in the S5 and the S7 variants. However, the latter is also available with the 140PS/320Nm tune. It goes without saying that the range-topper, the S11, comes with the most powerful engine. Tata Safari Storme: Tata’s smug mobile has started to feel dated. But there is no getting away from the fact that it is still just as imposing and just as capable off-road as ever. The 4x4 variant is slightly more affordable than the Scorpio’s. That said, the Scorpio is a more rounded product. Honda BR-V: Honda's offering in the segment is essentially a jacked up Mobilio with some mechanical changes to compensate for the raised stance. It is the only crossover here which can seat seven people. Nissan Terrano: The Duster's better-looking cousin (yes, looks are subjective), the Terrano suffers from being too overpriced for its own good. It does get a diesel AMT variant, which is a good option for those looking for a convenient urban SUV. Renault Duster: The car that started it all, the Renault Duster is the only modern crossover in the segment to feature an AWD system. Its butch design, adequate space, CVT transmission (petrol), AMT (diesel) and all-weather ability make it score a lot of brownie points in the segment. However, its interior quality and limited service network make it less appealing. The Scorpio has its faults. It isn’t built with the best of materials and its body-roll in fast corners feels like its drunk on half a bottle of Absinthe. That said, if you want a car that can tackle the worst of terrains, carry seven on board in relative comfort with its robust suspension and has enough oomph to get you home on time, the Scorpio is absolutely formidable. Its a beast!It could be nice if it has airbags!